A vintage coat and a stranger's bucket list - what could possibly go wrong? What an enjoyable read from this new author, Joanne Tracey. It's "chick lit" to a tee, and was quite difficult to put down once I got started. 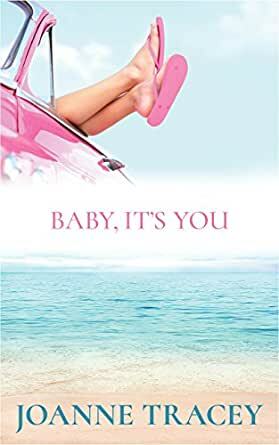 I can always tell I'm going to enjoy a book when the characters get in my head and I can't wait to see where they go next - that's exactly what happened with Baby, It's You. Yes, it did end how I thought it was going to end - but that's exactly how I wanted it to go. Well, for the most part. Looking forward to reading more from her in the future - great way to spend a Sunday afternoon curled up under a blanket with a cup of tea and virtually wandering through the familiarities of Melbourne. A story about thinking you know yourself, losing yourself and re-finding who you should have been all along. Quirky, warm, funny, and ultimately lovely. I liked this so much I read it in a day. Then I read it again a week later. I hope this author writes more. I really like her style. Classic chick-lit. Baby,It's you is full of the drama and laughter of every woman's life. An easy read with likeable characters - even though Em drove me a bit batty!! Definitely worth a read. Would be a great holiday book. It was a great story , enjoyed it , looking forward to more. 4.0 out of 5 starsEmily Porter is like a more-evolved Bridget Jones... complete with someone else's bucket list. I'm not usually a fan of chick lit so approached this book nervously even though I'm a fan of the debut author's blog. However I needn't have worried as I enjoyed the book so much I read it in a sitting! Emily, Josh (Booth) and Suse are best friends who met when working together a long time ago. Suse’s now married with kids and a high-flying career while Emily and Booth continue to work in the same software / IT company. We initially meet all three at their regularly Friday night drinks. They’re talking bucket lists and both Booth and Suse have them and are shocked avid list-maker Emily doesn’t have one. Although she eventually confesses, while she doesn’t have a to-do-before-I-die list, she has her dreams. She’s just not sure they involve her boyfriend Craig. He’s talking about living together and happily ever after, but she’s not sure they’re a good fit. They hate each other’s friends and it’s pretty obvious to everyone around them their relationship is about to implode, rendering Emily’s Craig-related pros and cons list redundant. But it’s not only Em’s relationship causing her angst, she’s feeling a bit stale in her career and wants a change. Emily’s passion for second-hand and vintage clothes proves fortuitous when she discovers a bucket list in the pocket of an old coat. The list—and the coat—are seemingly made just for her. Although the list does require a bit of tweaking! Enter the flirty and handsome newcomer at Emily's workplace—who could be everything she's looking for in an ideal partner. Emily is very Bridget Jones-esque. Albeit a more evolved and adult (and less-annoying) Bridget. I loved all three lead characters, particularly Emily and Booth. Their witty banter felt very authentic and I thought I could easily be listening to their conversation in a bar somewhere. I loved everything about this book. Likeable and relatable characters, smart and sassy storyline, and a perfect ending. The setting of Melbourne and later Bali was so well written it feels like you are there. And I was 100% invested in the characters and their plight. Great fun read.